The two major shipyards in northern Russia, the Sevmash and Zvezdochka, intend to become main producers of equipment for offshore field development in the Russian Arctic. First however, they will have to sort out a number of serious internal problems. Next spring, the Severodvinsk-based Sevmash is likely to take part in Gazprom’s announced tender on the production of another two drilling rigs for Shtokman. The previous tender on Shtokman rigs was won by the Vyborg Shipyard. These are to be constructed and handed over to Gazprom in 2011. Totally Gazprom will need 40 platforms, including 10 for the Shtokman project, before the 2030. Meanwhile, Sevmash, the biggest Russian shipyard, last week upset customers with information about cost overruns in the Prirazlomnaya oil platform project. Now, the cost of the Prirazlomnaya platform, the main element for development of the field with the same name in the Pechora Sea, is estimated to 3 billion USD, while the price tag in the beginning of the project ten years ago was only 850 million USD. Sevmash also announced that the platform completion will be delayed with another year. The construction of the platforms was started 10 years ago and since then the date of its completion has been delayed several times. In 1998 it was reported that the first oil from the platform will be pumped into the tankers in 2001. But after the project was left by the foreign investors – BHP in 1998 and Wintershall in 2001, - the dates were corrected almost annually. It is interesting to mention that the official site of Sevmorneftegaz, the Gazprom subsidiary and the main Prirazlomnaya customer, still is convinced that the platform should extract the first oil in 2006! The problems of Sevmash are on the agenda both of the Arkhangelsk regional administration and the federal government. The last years have shown that the Severodvinsk plants are not ready to take on a number of contracts for the non-military industrial sector. 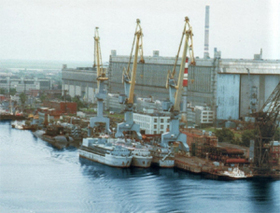 Earlier, the Severodvinsk yards were living well on defence contracts alone. In November this year, the Federation Council committee on national marine policy held a meeting in Severodvinsk where the situation at Sevmash and Zvezdochka was discussed. The committee members made a number of conclusions. The current outdated equipment can not provide necessary production quality; there is a lack of modern technology; there is a strong deficit of skilled workers. The committee also concluded that serious mistakes in the management of the companies have lead to their damaged reputation. In the beginning of this year, the contract between Sevmash and Norwegian shipping company Odfjell on construction of 12 chemical carriers was cancelled. Odfjell motivated the decision with serious delays combined with an increase in the price of the contract from 500 million USD to 544 million USD. Some time later, the state corporation Rosatom withdrew from the contract on the construction of floating nuclear power plants, arguing that Sevmash is overloaded with state military orders. This happened just after Sevmash informed the Rosatom that the first nuclear floating plant construction will be delayed by with five months. The contract now is placed in Saint Petersburg-based Baltiiskii Shipyard. In addition, the launch of the newest strategic submarine, the Yury Dologoruky, at Sevmash has been delayed with one year. The modernization of the aircraft carrier Admiral Gorshkov, which according to the contract with the Indian Navy was to be ready in summer this year, is postponed until 2012 and its cost increased almost twice. The reason is that a sufficient part of construction works were simply not accounted in the contract. Meanwhile, Sevmash intends to take part in the Ministry of Defense tender on construction the new aircraft-carriers for the Russian Navy and according to admiral Vyacheslav Popov, the former Commander-in-Chief of the Northern Fleet, has good chances to win the competition with its main competitor Baltiiskii Shipyard. One of the main problems at Sevmash is a strong deficit of skilled workers. Today, the plant employs over 25 000 people but the staff deficit could make up 3500 people by year 2012. At the same time, the population in Severodvinsk is decreasing. Only in the six months of 2008, over 1000 people out-migrated either to Moscow or Saint Petersburg, or the city of Arkhangelsk. This problem was discussed at a round-table meeting organized by the Severodvinsk city administration in October this year. One solution, supported by the Arkhangelsk regional is the development of a special program on the recruitment of specialists. Among the possibilities solutions is the attraction of workers from the Middle East, Belarus or Ukraine.